Much to the horror of the city’s adults, children and teens in masks, carrying guns, are becoming an increasingly common sight on Mosul’s streets. NIQASH meets ISIS’s youngest recruit – he’s ten years old – and asks the city’s youth why they think it’s so glamorous to fight for the Sunni extremist group. It was a surprising sight. The customers standing in Haj Hamdoun’s store in central Mosul watched as a masked child came into the shop, buy what he wanted without saying a word and then leave again, carrying a bag containing candies and milk in one hand and a heavy machine gun, that was just about as big as him, in the other. 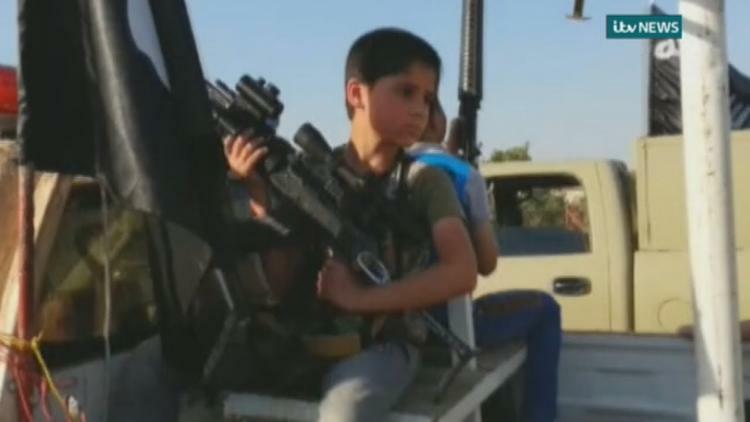 This was Abdullah, who is apparently the city’s youngest volunteer with the Sunni extremist group, the Islamic State of Iraq and Syria or ISIS, that took control of Mosul over two weeks ago. Abdullah is not yet 11 years old. But his older brother and his father, who was a senior member of ISIS, were killed in fighting between the extremist group and Iraqi security forces in 2013. That’s why Abdullah joined ISIS. The storeowner, Hamdoun, says he has actually become used to seeing Abdullah wandering around, carrying his big gun with both pride and difficulty. He has also seen the boy on guard duty together with other ISIS fighters in front of the new ISIS headquarters in Mosul, originally the home of a government official. Abdullah may be the youngest volunteer with ISIS but he is not the only child or teenager to have become enthusiastic about bearing arms for the extremist group in Mosul. As soon as ISIS arrived here, they began to attract new members, mostly teenagers and young men aged between 10 and 30, who were drawn to the glamour of the group’s obvious power and the adventure of joining such a well-armed gang. Although estimates vary, the number of ISIS gunmen who eventually took control of Mosul was certainly not more than 4,000. So they need more recruits, both to control the territories they have and to join the fight on other fronts within Iraq. This appetite to join ISIS has become a source of concern for Mosul’s families. Locals in the city are only too well aware that many of those now controlling their city are young people who only volunteered to join ISIS several days ago and that many of them are new to the weapons they carry. Locals also know that ISIS needs more fighters in places like Tikrit, Anbar, Diyala and towards Kirkuk. Despite that obvious need for more fighters, ISIS does have certain rules for membership. Firstly, the volunteer must be willing to obey their ISIS leader even if his orders may result in their death. Those who do not obey orders or those who retreat will be considered apostates, for which the penalty is death. Additionally any volunteer that wants to join must be recommended personally by another member of ISIS, who must have belonged to the organisation for not less than two years. The volunteer must have good conduct and must be committed to the teachings of Islamic law, as defined by the Sunni branch of the religion. And if the volunteer was formerly a member of the state security forces, he can only join a year after declaring repentance. ISIS offer any member of local security forces or police a pardon in return for declaring repentance at one of several mosques set up for the purpose. Once a volunteer is accepted, they are given religious lessons in accordance with the strict Salafist doctrine, trained in the use of weapons and they also undergo physical training. But there are other obstacles that young Mosul men who want to join ISIS may also have to overcome. In the case of Mosul woman, Saad’s son, it was his own mother who stood in the way. Saad, who wished only to be known by her first name for security reasons, said that although a neighbour tried to calm her by telling her that at least 50 other young men from their neighbourhood had gone to join ISIS and that many others were on the way to do the same, she could not give up on her son. Saad says she went to the centre where all the young men were volunteering and managed to get an appointment with the emir, or leader, who was responsible for that particular group of volunteers. In tears, Saad begged him to release her son, who was her family’s only provider; Saad also has six daughters. She told him that she had lost her older son but couldn’t bear to lose her second son too. The emir agreed to release Saad’s son from ISIS. Locals say this is not the first time this has happened. The emir often receives household heads asking him to let their sons leave ISIS and apparently he often responds positively. In many ways the turnaround in opinions has been interesting. Previous to ISIS’ arrival, it seemed many young people in Mosul were opposed to them because of their cruel methods, killing and bombing. But since the group took control of the city, they have started to become supporters and soldiers for ISIS. The one fear they all have though is what might happen to them if the Iraqi government and the militias supporting them gain control of Mosul again. Some young men in Mosul also worry that ISIS may start a conscription system, once they run out of willing volunteers. This fear was exacerbated when one of the city’s tribal leaders received a request asking him to send a certain number of men from his tribe to join ISIS. There are still a large number of young people in Mosul who do not want to join ISIS. This is especially true of the better-educated youth. As one of them says, they have chosen to stay in their homes because, while they may have some political anti-government sympathies, they “don’t want to join hands with those whose hands are stained with blood”. Those Mosul locals who have avoided volunteering say that they think the new volunteers will soon try to leave the organization again, once the glamour wears off. No doubt, those who stay with ISIS will be the likes of Abdullah, whose childhood innocence has been stolen by ISIS, and who will simply become one of the increasing numbers of children patrolling Mosul’s streets with guns. Unfortunately now seeing a child like Abdullah, armed and shopping for candy in a mask, is no longer a surprise; it is a sight the Mosul’s citizens are getting used to.